The generally accepted definition of the word antique is an object that is over 100 years old. So, one would assume that any piece of silver produced before circa 1900 is an 'antique' piece of silver. Likewise, anything produced after that date is a 'modern' piece of silver. Well not quite! Traditionally, antique silver was used by auctioneers to describe pieces produced prior to the middle of Queen Victoria's reign; anything later was classed as modern silver. 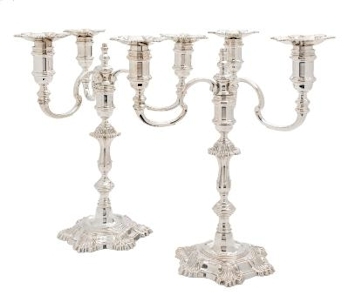 A pair of Elizabeth II silver three-branch candelabra, maker JB Chatterley & Sons Ltd, Birmingham, 1992 (FS39/18), proved popular selling for £1,350. Therefore, silver categorised as 'Modern Silver' within our auctions includes silver from the Arts and Craft period, Art Nouveau silver, silver from the Art Deco era and silver right up to the modern day. Designers and retailers, such as Christopher Dresser, Omar Ramsden, Archibald Knox, Liberty & Co and Stuart Devlin will all be found within this category. 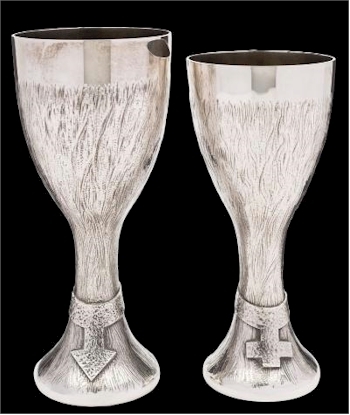 Modernist Silver 'His & Hers' Wine Goblets, maker Christopher Nigel Lawrence, London, 1974 (CC1/84) realised £750. With the growth of the industrial age, wealth and wages have risen giving far more people the opportunity to purchase practical, yet beautifully designed pieces of silverwares. From Christopher Dresser through to the Arts and Craft movement, simplicity of design and a back to basics philosophy saw an expansion in domestic silverware. Morris & Co together with Liberty & Co were the great retail outlets. One silversmith, out of the many that span this period, is Charles Boynton (1885–1958) and his designs are very popular and collectable. From curved sauceboats with soft lines to harsh cubist tea services, his designs spanned many tastes.